What are the different types of quadriceps injuries? What are causes and risk factors for a quadriceps injury? What are symptoms and signs of a quadriceps injury? What tests do health care professionals use to diagnose a quadriceps injury? What is the treatment for a quadriceps injury? Are there home remedies for a quadriceps injury? What is the recovery time for a quadriceps injury? What is the prognosis of a quadriceps injury? What are complications of a quadriceps injury? Is it possible to prevent a quadriceps injury? The quadriceps is made up of four muscles that are located on the front of the thigh. 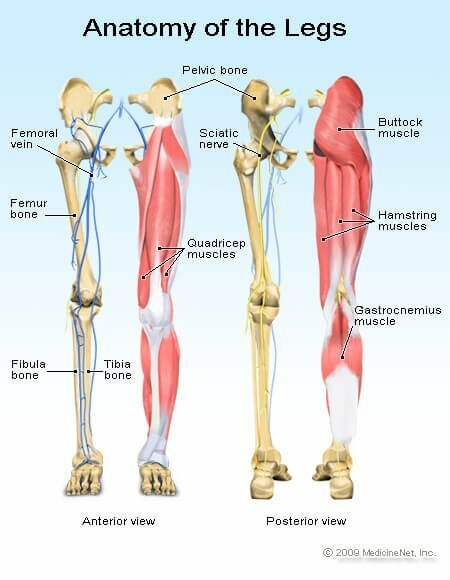 The muscle is responsible for flexing the hip and extending or straightening the knee. Treatment most often involves RICE (rest, ice, compression, and elevation), and sometimes physical therapy is needed to help regain range of motion and muscle strength. Surgery may be needed to repair tendon ruptures, muscle herniation, and to relieve compartment syndrome. The rectus femoris begins with its attachment to the ilium, one of the pelvic bones and then crosses the hip. As it runs down the front of the thigh, the muscle portion of the rectus transitions to become a tendon and joins the tendons of the three vastus muscles to form the quadriceps tendon, just above the kneecap (patella). The tendon is renamed the patellar tendon as it crosses the knee joint and attaches to the tibial tubercle, the bony prominence on the tibia (shinbone). The quadriceps muscles are contained within a fascia compartment, a sheet of fibrous connective tissue, along with the femoral artery and the femoral nerve. Limping can result from either an acute (having a recent onset) or chronic (long-term) condition. Injuries such as bone fractures, sprains, and strains are common causes of limping. The most common injury of the quadriceps is a contusion or bruise, caused by a direct blow to the anterior thigh, which can cause some blood vessels within the muscle to be damaged and bleed. This causes pain due to inflammation of the surrounding muscle. Since the rectus femoris muscle lies closest to the surface of the anterior thigh, it is the muscle most often contused. If there is significant bleeding into the muscle, compartment syndrome may occur, where the pressure within the compartment that contains the quadriceps rises higher than blood pressure, thereby preventing muscle tissue from being supplied with oxygen-rich blood pumped from the heart. The quadriceps may also be strained due to overuse or overstretching. The strain may involve muscle fibers, tendon fibers, or both. Muscle strains can be categorized depending on the severity of injury. There are three different grades of muscle strains. Grade 1 strains involve muscle fibers that are stretched but not torn. Grade 2 strains involve a muscle that is partially torn with more extensive damage. Grade 3 strains occur when a muscle is completely torn. Tendinitis describes inflammation of the tendon (itis=inflammation). Jumper's knee or peri-patellar tendinosis describes chronic degeneration of the tendon where the muscle fibers transition into tendon fibers just above the patella (kneecap). Quadriceps tendinitis describes inflammation of the tendon above the patella. Patellar tendinitis describes inflammation below the patella at the level of the knee joint. Osgood-Schlatter disease, also known as apophysitis of the tibial tubercle, occurs when there is inflammation of the bone where the patellar tendon attaches the quadriceps muscles to the tibia. While it is most commonly seen in adolescents, it may also occur in adults. The quadriceps or the patellar tendon may completely rupture, which leads to the inability to fully extend or straighten the knee. Rarely, the fascia that surrounds and contains the quadriceps may tear and the muscles may herniate through the defect. Contusions are usually caused by a direct blow to the quadriceps muscle, usually by another person or by an object. This can cause damage to the muscle fibers and associated bleeding. If there is significant trauma, like a major crush injury or if there is an associated fractured femur, enough bleeding can occur so that the pressure increases inside of the compartment that contains the quadriceps muscles. Compartment syndrome is a surgical emergency that occurs when pressure inside the muscle compartment is so high that it prevents adequate blood flow to the muscle itself. This can cause the muscle cells to die due to the lack of oxygen supply, and it may also lead to long-term muscle and nerve damage. Strains of the quadriceps occur as a consequence of repetitive overuse, causing muscle fibers to become inflamed and sometimes partially tear. Usually, there is greater load bearing than the muscle can tolerate; think of the leg repetitively straightening while lifting weights, causing the muscle to fatigue and potentially become damaged. This is commonly seen in athletes who are weight training, but it can also occur in people who perform manual labor that requires some degree of lifting heavier objects. Partial tears can also occur when running or kicking. Tendinitis is inflammation of the tendon that attaches the quadriceps muscles to the tibial tubercle. Most commonly, the patellar tendon becomes inflamed, leading to pain and swelling in the area below the kneecap. This is a repetitive injury problem as well, where damage occurs to the tendon causing acute inflammation. Peri-patellar tendinosis or jumper's knee is an overuse injury where microtears occur in the area where the quadriceps tendon inserts into the top or bottom of the patella. Instead of causing acute inflammation, the area starts degenerating and scarring. This injury most commonly occurs in people who repeatedly engage in sports that involve intense jumping like volleyball, basketball, or track and field. Tendon rupture occurs when there is a violent contraction of the quadriceps muscle when the knee is flexed (bent), causing the quadriceps or patellar tendon to completely tear or rupture. Quadriceps tendon rupture occurs more commonly in patients who are older than 40 years of age. Patellar tendon rupture occurs less frequently and is typically seen in younger patients. Muscle hernia occurs when the muscle fascia tears and part of the quadriceps muscle protrudes (herniates) through the opening. This usually occurs when the muscle fascia has been previously injured and is somewhat weakened, though the cause may be uncertain. A forceful kick may cause the muscle to herniate. As with most orthopedic injuries, the initial symptom of a quadriceps strain, partial muscle tear, or tendinitis/tendinosis is pain and tenderness. There may also be swelling and decreased range of motion that may result in a limp. This pain may be acute in onset, or it may arise gradually and become progressively more painful with activity. If there is a complete rupture of the quadriceps or patellar tendon, in addition to pain, the patient will be unable to fully extend the knee because the connection of the quadriceps muscle to the bone has been lost. Compartment syndrome presents with intense pain, often out of proportion to the physical examination. There may be decreased range of motion of the leg and changes in sensation in the leg and foot. A health care provider often makes the diagnosis of most quadriceps injuries by taking a detailed history of the injury and performing a physical examination. Contusion, muscles strain, tendon inflammation, tendon rupture, and muscle herniation are often diagnosed at the bedside. Plain X-rays may be helpful if there is concern that there is an associated fracture (broken bone) of the femur or patella. Myositis ossificans (a bony growth which develops within the muscle) may also be seen on plain films. In certain instances, MRI may be performed to confirm the diagnosis made at the bedside. Ultrasound may be useful to determine a partial versus a complete tendon rupture. Creatine phosphokinase (CPK or CK) levels may be measured if there is concern that major muscle damage has occurred. CPK leaks from damaged muscle cells and levels can be markedly elevated in rhabdomyolysis. Creatinine is a blood test that measures kidney function. Patients with significant muscle damage and rhabdomyolysis can develop kidney failure. If compartment syndrome is suspected, the compartment pressure can be measured by inserting a probe into the muscle compartment and directly measuring the pressure within it. Most quadriceps injuries can be treated with RICE (rest, ice, compression, and elevation). However, compartment syndrome is a surgical emergency, and many cases of tendon rupture will also require surgical management. Crutches or other gait-assist devices might be needed depending upon the level of pain and whether or not the individual can weight-bear on the injured leg. After a short period of rest, most people can start returning to normal function as pain allows. However, for athletes or for those who lift or repetitively bend/squat at work or home, physical therapy might be needed to regain range of motion and strength in the injured leg. Anti-inflammatory medications such as ibuprofen (Motrin and Advil) may be helpful. Even though these medications are available over the counter, it is important to make certain that they are safe to take for the individual patient. They may not be appropriate for patients with peptic ulcer disease, those with bleeding disorders, those with kidney disease, and those patients who are taking anticoagulation medications (blood thinners). Health care providers and pharmacists are able to give advice regarding the safety of over-the-counter medications. Most quadriceps injuries can initially be treated at home with rest, ice, compression, and elevation. Ibuprofen may be used as an anti-inflammatory and for pain control. If the pain is worsening or if a limp persists for more than a few hours, seek medical care for an evaluation. Emergency medical care should be pursued if the patient cannot extend or straighten the knee (concern for tendon rupture), or if there is intense pain, swelling, and numbness of the leg (concern for compartment syndrome). It is also appropriate to seek emergency care if there was a significant traumatic event like a car wreck, major fall, or other injury. This is especially true in patients who are taking anticoagulation medications and are at increased risk of bleeding. The recovery time for a quadriceps injury depends upon the injury and may range from a few days for a contusion to many months for a ruptured tendon. The goal of treatment for all quadriceps injuries is to have the patient return to the same level of activity as before the injury. In most cases, this is possible, depending upon the underlying medical condition of the patient and the severity of the injury. When a large muscle like the quadriceps is injured, the body can lay down excess calcium as part of the healing process. This condition, called myositis ossificans, can cause pain and decreased range of motion in the affected leg. The initial treatment includes rest, ice, and anti-inflammatory medications like ibuprofen (Motrin and Advil). Physical therapy may be considered to increase range of motion. After many months, if this fails, surgery may be needed to remove the excess bone. Compartment syndrome may occur as a complication of trauma to the anterior compartment of the thigh, where the quadriceps muscle group is located. Crush injuries or a fractured femur is often the cause. Compartment syndrome is a surgical emergency, and the compartment needs to be opened to relieve the pressure and to prevent permanent muscle and nerve damage. Sometimes quadriceps injuries occur and cannot be entirely prevented. An accidental direct blow to the quadriceps resulting in a contusion, for example, can occur during a sporting activity. Overuse injuries may be preventable, especially if the patient ignores warning signs of mild discomfort and continues with repetitive activities that cause further damage. It's often possible to prevent muscle strains by making certain that the quadriceps muscle has been adequately stretched before vigorous activity. Individuals should always stretch and warm up before exercising, People who do physical labor at work and around the house should also take a few minutes to warm up before engaging in these activities. Similarly, after exertion, a muscle may also need to be cooled down, stretched, and rested to prevent muscle strains, tendinitis, and even tendon rupture. Cleland, J., S. Koppenhaver, and J. Su. Netter's Orthopaedic Clinical Examination, 3rd Edition. China: Elsevier, 2015. Please describe your experience with a quadriceps injury. What symptoms or signs did you experience with a quadriceps injury? How long did it take you to recover from your quadriceps injury? Leg, calf and thigh pain are symptoms of conditions that may involve the muscles, nerves, and more. Sensations like tingling, cramps, and numbness may also occur. Injuries, blood clots, and inflammatory conditions like rheumatoid arthritis may cause leg pain. Osgood-Schlatter disease, a painful inflammation just below the knee but above the shin, typically affects adolescent boys. Symptoms include localized pain, inflammation, swelling, and calcification. Osgood-Schlatter disease typically goes away over time, however, symptoms can be helped with anti-inflammatory and pain-relieving medications, ice, and rest.